D r Kostis Hassiotis, who completed the Doctor of Musical Arts (DMA) programme at City University London in 2010 under the supervision of Dr Christopher Wiley, has recently published a book based on his doctoral thesis. Entitled F. W. Ferling’s 48 Studies for Oboe, Op. 31: A Critical Edition Based on Historical Evidence with Particular Reference to Nineteenth-Century Performing Practices (ISBN: 978-3-8465-9724-8), the book is available for purchase from stores including Amazon and MoreBooks. 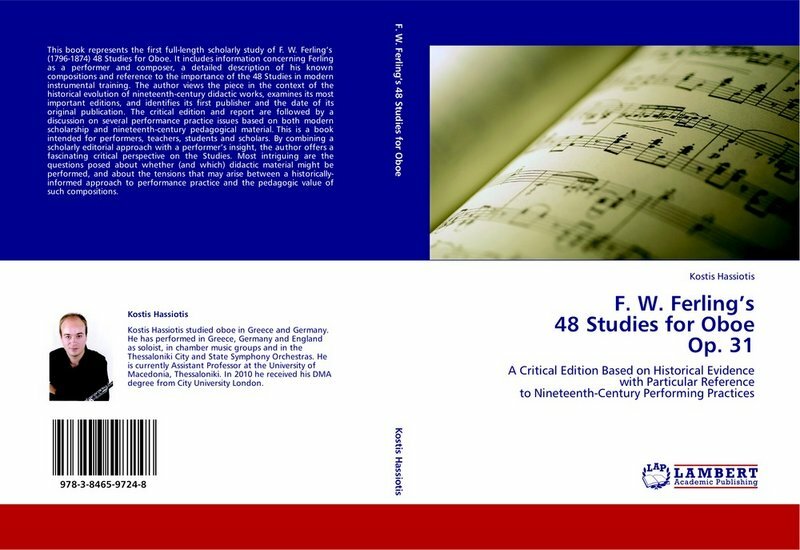 As the first systematic investigation of Ferling’s landmark 48 Studies for Oboe, the book includes information concerning Ferling as a performer and composer, a detailed description of his known compositions, and reference to the importance of the 48 Studies in modern instrumental training. Now Assistant Professor of Oboe at the University of Macedonia, Thessaloniki, Dr Hassiotis is active internationally as a performer and researcher.